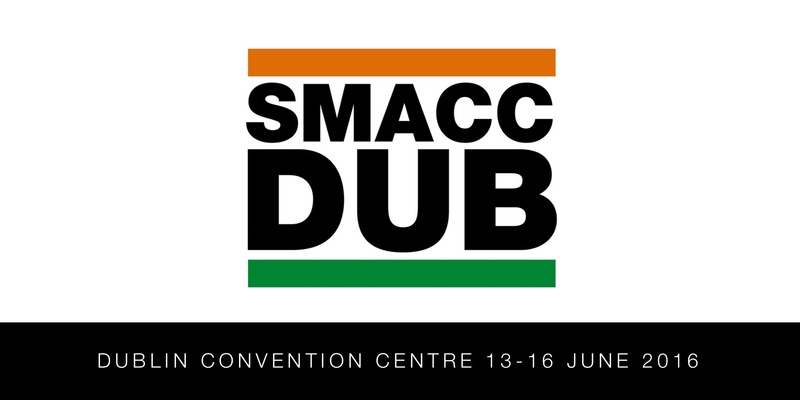 This post was generated for the SMACC Dublin Workshop in March 2014, but it’s just as relevant to anyone interested in putting an evidence based review together. Once you have formulated your three part question it’s time to go to the literature and find out what’s out there. Your 3PQ is essential to this, so if you are not happy with it yet, or if you have not formulated a 3PQ then stop, turn round and do that first. This page is based around formulating a BET, but all the principles apply equally to any evidence based review. We suggest that you search using a variety of clinical databases. As a minimum we search Medline from 1966 to the present day. We also advocate searching in other databases such as Embase and on the Cochrane databases. Cochrane is always worth a look if you are considering a question related to therapy as you may find useful information in the form of a review or in their database of clinical trials (CENTRAL). If you do find a review that’s fine, you can include it in your BET (once you have critically appraised it), but check the date of the review. If a systematic review has been done we usually include it in the BET, but also search in the other databases in the months and years following the last search published in the review. It is surprising how often you will find additional papers if you do this. As BETs was originally designed for the practicing emergency physician most searches on the database consist of Medline searches due to its accessibility. How you actually input the search will depend upon which database you are searching and on also on which interface you are using. Despite this a few general principles will always apply. If you want help or advice with searching then you could speak to an experienced colleague, a librarian (or information scientists as we like to call them!) or have a look at some of the web sites on our links pages. A good librarian is worth their weight in gold and in our experience they are very helpful so long as you can present them with an answerable question. You should construct your search in such a way that it will have the best chance of finding any relevant papers. Remember we aim to define what evidence is available, not just cherry pick a few (superficially) high quality papers. So far, the majority of BETs have solely used Medline. Medline is good but we would also suggest that you should have a look at other databases, particularly the Cochrane database as this may turn up some additional useful information. For some questions, for example those related to nursing, you will need to use specific databases such as CINAHL which have a better coverage in these clinical topic areas. For advice on this we suggest you speak to your local medical librarian. There are no absolute restrictions on where you go looking for information to include in the BET. As long as it is explicit and that we can understand, follow and if necessary repeat it, it can be included in your search strategy. We usually achieve this by using the three part question as a model. We start by looking at each component of the three part question and thinking of all possible terms relating to that element of the question. Most search engines have a thesaurus function that will assist you by interpreting any terms and suggesting index terms on the database. PubMed will probably feature in your searches, so check out their online tutorial here. By putting all the terms together using an “OR” function you should be able to link in any relevant papers for each parts of the question. You can then combine each group together using an “AND” function to identify papers specific to the three part question. The number of papers you get back will vary depending upon the search strategy and also on the topic itself. 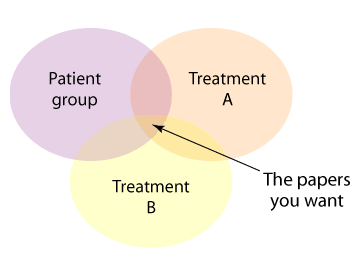 Broaden the terms relating to the patient group (e.g. instead of specifying a small age range, try all ages, the papers you find may still be relevant). If your search program has a LIMIT function then consider limiting your search to papers in languages you can read (though we recommend you at least look at the abstracts of these papers as the abstracts are often in English and you do not want to miss an important publication). In addition, excluding papers without abstracts will differentiate true papers from letters to journals (for example, by using the Boolean ‘NOT’ to exclude letters or editorials). If you are considering some technologies or conditions that did not exist before a certain date then limit your search to specific years. You may also use a “filter” to look for papers of certain types. Filters are a sequence of search terms that we use to identify papers of certain types, for example you may use a filter that will pick out any paper that is likely to be a randomised controlled trial. That would be particularly helpful if you were searching on a question comparing two different treatments. There are also filters in development for other types of papers but also for certain patient groups such as children, or for certain therapies such as steroids or antibiotics. For more information on searching in BestBETs and the use of filters please take a look at our search strategies information page. Altogether ** papers were found in Medline and ** in Cochrane, of which ** were irrelevant or of insufficient quality. A further ** papers were found by scanning the references of relevant papers. All relevant papers are summarised in the table. Basically, anyone reading your BET should be able to repeat the search and understand completely how you came to the number of papers found that you state. We consider up to 200 papers to be a manageable number to take onto the next stage. The principle author should give the 3 part question ONLY to the second checker. It is then the role of the second checker to formulate their own search strategy and to try and find any relevant papers. They then take the second search strategy back to the principal author and compare the approaches. If the second search produces more relevant papers it should be adopted as the strategy for that BET. The search checker should NOT just input the search terms used by the original author as that runs the risk of replicating any mistakes/omissions already made. So, those are the principles behind a focused, achievable and relevant search based on your three part question. At first you will need help, with librarians perfect to assist you. With time you will get faster and more focused, when you are make sure you share that learning with your colleagues. Databases Advanced Search (HDAS): http://www.library.nhs.uk/hdas HDAS offers a common intreface to databases from various providers. MEDLINE is currently the ProQuest version, while EMBASE is from Ovid. 2. Good advice about checking thesaurus terms when moving from database to database. But MeSH is the controlled vocabulary for MEDLINE, standing fvor MEdical Subject Headings. EMBASE has its own thesaurus, EMTREE, while CINAHL uses CINAHL Headings.